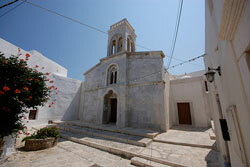 During summertime, exhibitions and other cultural events are held at the Cultural Centre at the Catholic Cathedral, situated in Chora’s Castle. 1–15 July: painting exhibition by Elodie de Pesters. 16–31 July: painting exhibition by Katerina Zazani. 1–15 August: group painting exhibition by Greek and foreign painters that live in Paros. 16–31 August: painting exhibition by Mettle Rosenvinge. 16–30 September: painting exhibition – art of candles by Elena Papakonstantinou.